Many countries in the New World and elsewhere celebrate the anniversary of Christopher Columbus's arrival in the Americas, which occurred on October 12, 1492 in the Julian calendar and October 21, 1492 in the modern Gregorian calendar, as an official holiday. The day is celebrated as Columbus Day in the United States, as Día de la Raza (Day of the Race) in many countries in Latin America, as Día de las Culturas (Day of the Cultures) in Costa Rica, as Discovery Day in The Bahamas, as Día de la Hispanidad and Fiesta Nacional in Spain, as Día de las Américas (Day of the Americas) in Uruguay and as Día de la Resistencia Indígena (Day of Indigenous Resistance) in Venezuela. These holidays have been celebrated unofficially since the late 18th century, and officially in various countries since the early 20th century. Columbus Day first became an official state holiday in Colorado in 1905, and became a federal holiday in 1934. But people have celebrated Columbus' voyage since the colonial period. In 1792, New York City and other eastern U.S. cities celebrated the 300th anniversary of his landing in the New World. In 1892, President Benjamin Harrison called upon the people of the United States to celebrate Columbus Day on the 400th anniversary of the event. During the 400-year anniversary in 1892, teachers, preachers, poets and politicians used Columbus Day rituals to teach ideals of patriotism. These patriotic rituals were framed around themes such as support for war, citizenship boundaries, the importance of loyalty to the nation, and celebrating social progress. Catholic immigration in the mid-nineteenth century induced discrimination from anti-immigrant activists such as the Ku Klux Klan. Like many other struggling immigrant communities, Catholics developed organizations to fight discrimination and provide insurance for the struggling immigrants. One such organization, the Knights of Columbus, chose that name in part because it saw Christopher Columbus as a fitting symbol of Catholic immigrants' right to citizenship: one of their own, a fellow Catholic, had discovered America. Some Italian-Americans observe Columbus Day as a celebration of their heritage, the first occasion being in New York City on October 12, 1866. Columbus Day was first popularized as a holiday in the United States through the lobbying of Angelo Noce, a first generation Italian, in Denver. The first official, regular Columbus Day holiday was proclaimed by Colorado governor Jesse F. McDonald in 1905 and made a statutory holiday in 1907. In April 1934, as a result of lobbying by the Knights of Columbus, Congress and President Franklin Delano Roosevelt October 12 was made a federal holiday under the name Columbus Day and a Federal holiday. Since 1971, the holiday has been fixed to the second Monday in October, coincidentally the same day as Thanksgiving in neighboring Canada (which was fixed to that date in 1959). It is generally observed today by banks, the bond market, the U.S. Postal Service and other federal agencies, most state government offices, and some school districts; however, some businesses and stock exchanges remain open. Actual observance varies in different parts of the United States, ranging from large-scale parades and events to complete non-observance. was a navigator, colonizer and explorer whose voyages across the Atlantic Ocean led to general European awareness of the American continents in the Western Hemisphere. 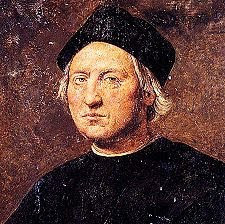 With his four voyages of discovery and several attempts at establishing a settlement on the island of Hispaniola, all funded by Isabella I of Castile, he initiated the process of Spanish colonization which foreshadowed general European colonization of the "New World."